Framed over a couple weeks at the end of November, this could be the last of the Gambrel truss styled barns of the past. This fall renovation project covered the entirety of the exterior of this 1950s raised bungalow in the Exhibition area of Saskatoon. This infill home adds a classic style with its duo-pitch hip roof truss design blended with a modern style of design. Essentially this house is brand new around the outside and boasts a greater R-value than the majority of new houses built today. Excellent work was done by all the workers and I’d be happy to recommend your company to other customers. I was very happy with your timely service and the speed with which the job was completed. Thank you for the great service. 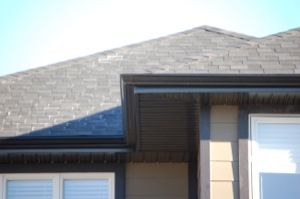 We are pleased with the roof shingles and especially the replacement of the roof support pillars. This solved a long standing problem and you and Paul came up with a great answer to the problem and the replace went very well. Looks great now!! We were very pleased with Home Sweet Builders. Their employees were friendly and responsible and did an excellent job. Personable, dependable, professional. We were impressed with your commitment to excellence and working cooperatively with us to ensure our roofing needs were met. We were extremely pleased with the quality of the work done. Thank you for for great service and excellent workmanship. I will definitely recommend your services. Troy and the crew are professional and courteous. They serve the customer’s unique needs and provide them with a high quality product at a competitive rate. We were extremely satisfied with the work done and with your employees. We had a few quotes done and you came in with the best price, you fixed our fireplace issue and you were the only company that actually got up on the roof before giving a quote. I was very pleased and satisfied with all aspects of my dealing with Home Sweet Home Builders. Everyone was professional, polite and efficient.